This comprehensive guide is a must-have for the multitude of fans of this best-selling genre of popular music. 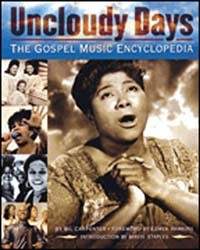 Uncloudy Days is a treasure chest of substantial profiles on the influential names in gospel music history such as Thomas Dorsey, Mahalia Jackson, the Hawkins family, Clara Ward, James Cleveland, and the Winans. It also uncovers the history of one hit wonders and others who are not as familiar to gospel music fans. Everyone has a story to share and this book tells more than 500 of them, many based on personal interviews, including the trials and tribulations endured by so many gospel artists. The author offers entertaining and informative reviews that lead readers to the best recordings by their favorite artists and help them find new music to explore. A glossary of terms and numerous charts showing the best-selling gospel recordings and videos of all time round out this entertaining and indispensable resource for current fans and new converts alike.